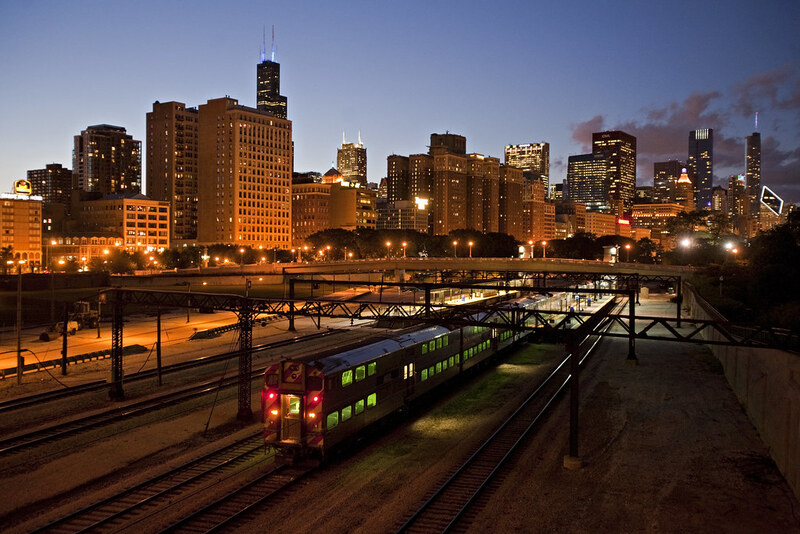 Outbound Metra commuter train departing downtown Chicago at North Halstead Street on September 14, 2011. 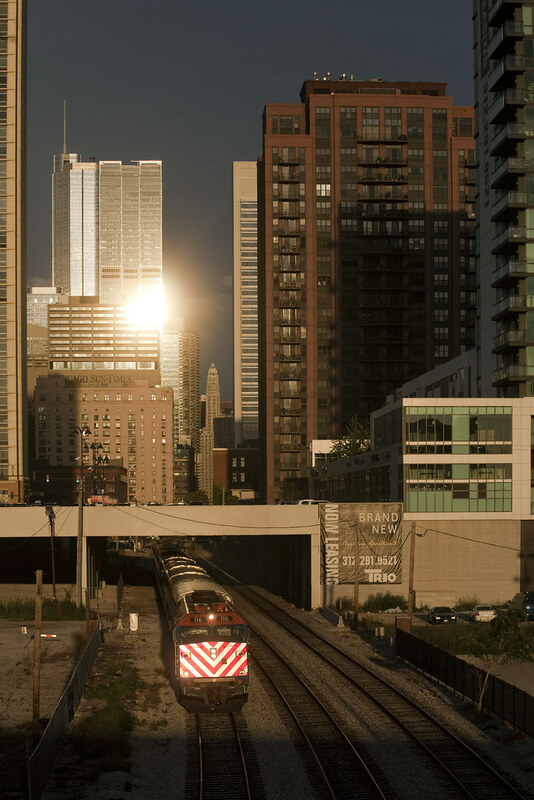 Inbound Metra commuter train as seen from North Halstead Street in downtown Chicago on September 14, 2011. 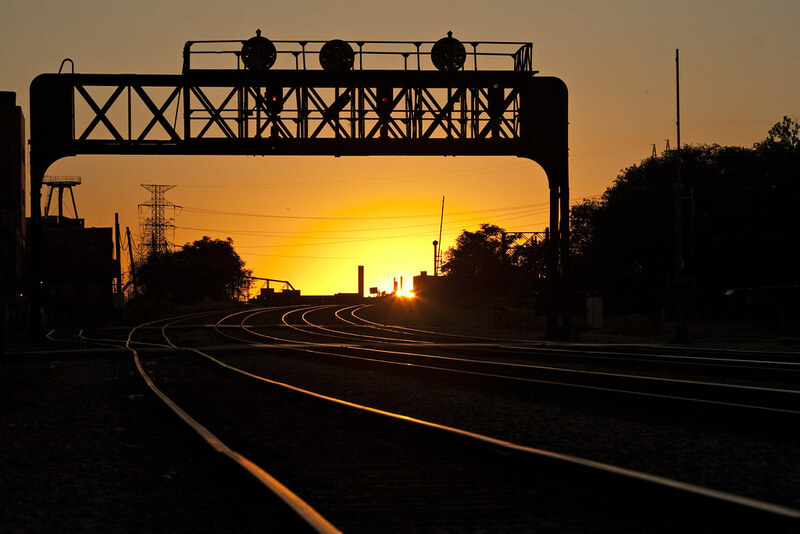 Former Pennsylvania Railroad position-light signal bridge at Racine Avenue in Chicago at sunset on September 14, 2011. 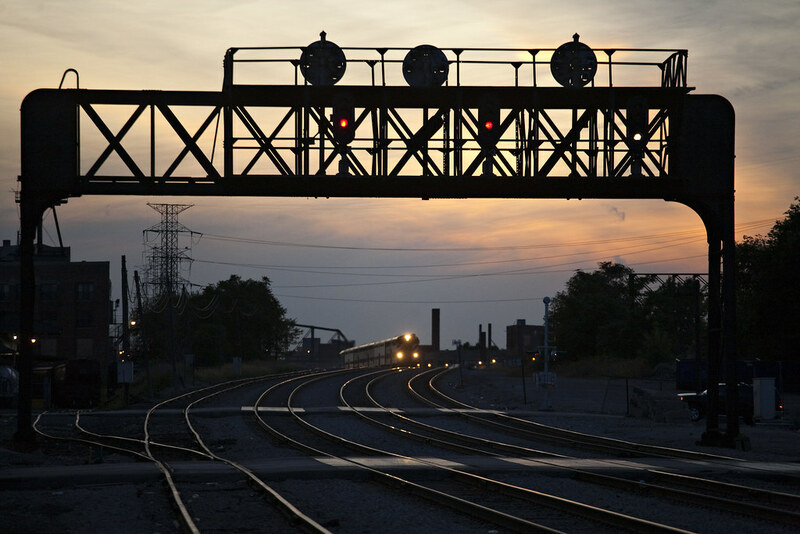 Outbound Metra commuter train departing Chicago at Racine Avenue at dusk on September 14, 2011. 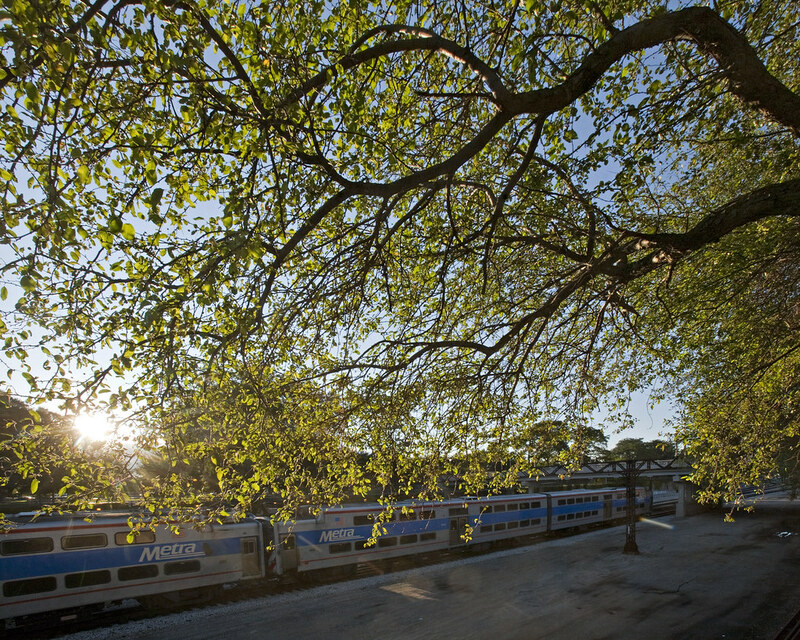 Inbound Metra Electric commuter train stopping at University Park in Chicago at dusk on September 14, 2011. 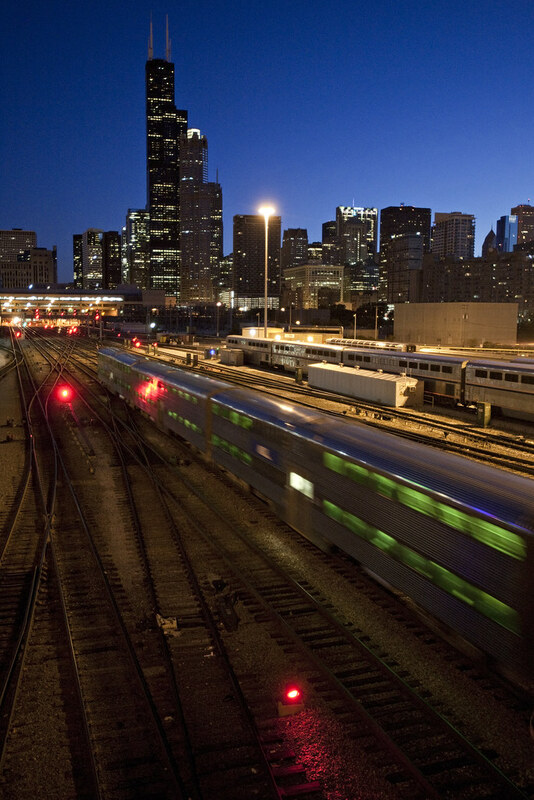 Inbound Metra commuter train arriving at Chicago Union Station at dawn on September 15, 2011. 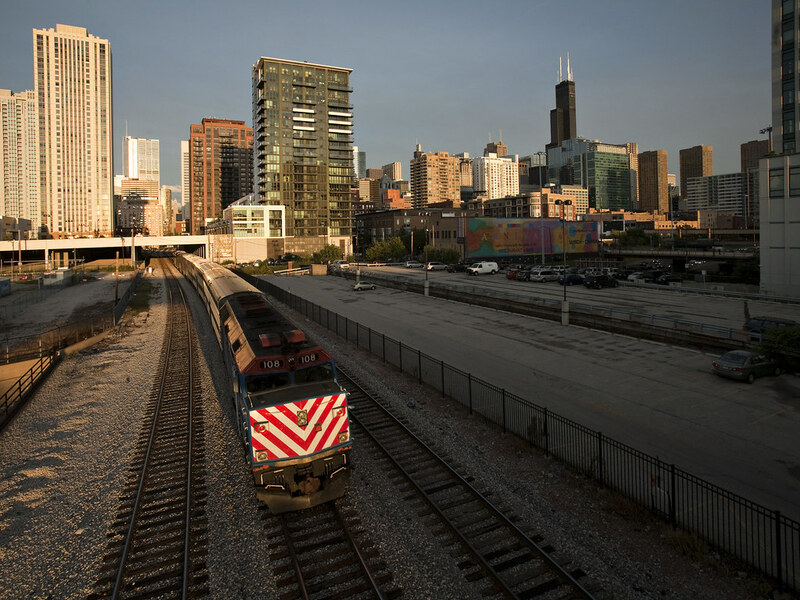 Outbound Metra Electric commuter train in Chicago on September 15, 2011. 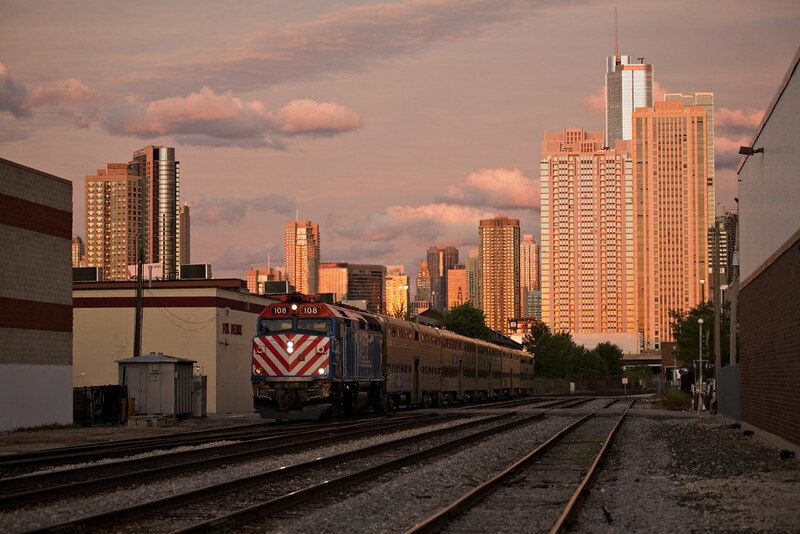 Inbound Metra commuter train coming into Chicago Union Station at North Halstead Street at sunset on September 15, 2011. 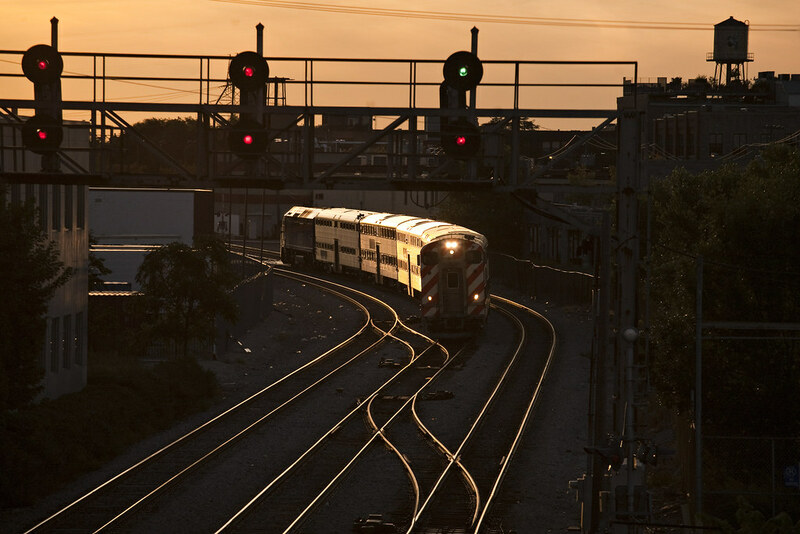 Inbound Metra commuter train approaching Chicago Union Station at Racine Avenue just after sunset on September 15, 2011. 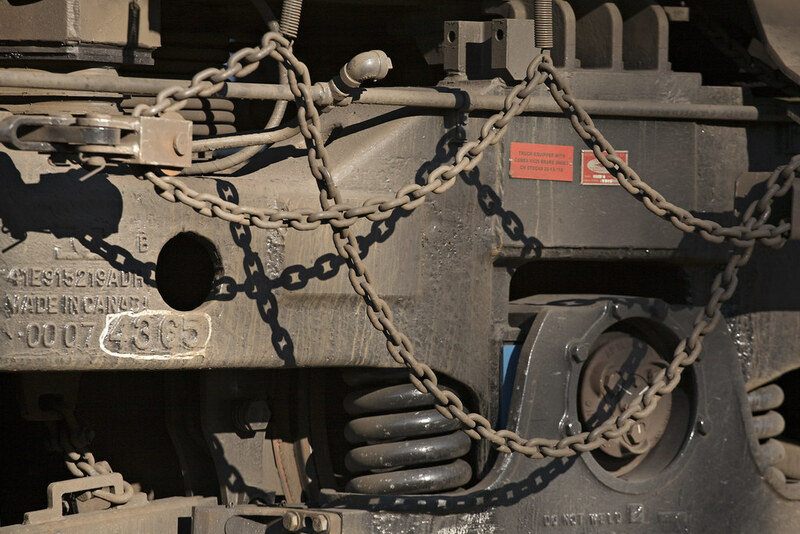 Detail of rear truck on BC Rail no. 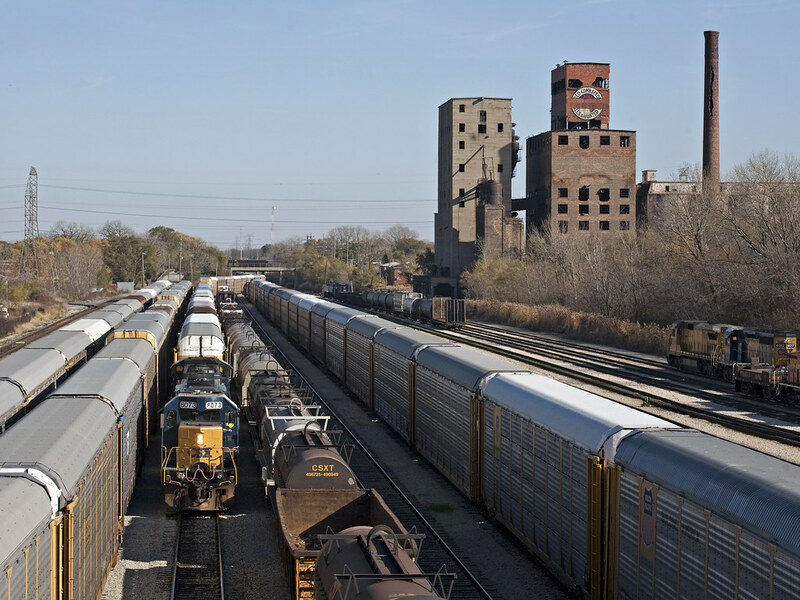 4644 at Canadian National's Markham Yard in Homewood, Illinois, on November 5, 2011. Amtrak passenger train no. 51, the westbound "Cardinal," approaching Thornton Crossing in South Holland, Illinois, on November 5, 2011. 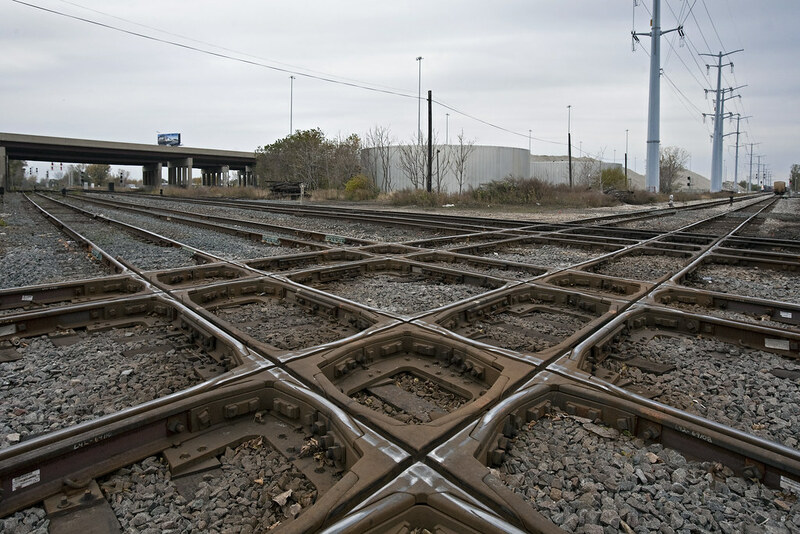 The crew had to stop the train and manually line the crossovers. Thorton Crossing in South Holland, Illinois. 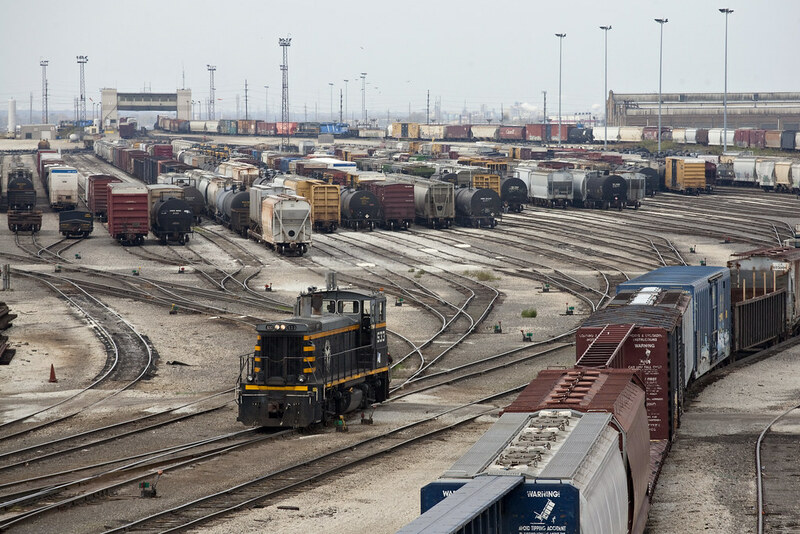 View is looking east on the Canadian National (left) and south on the Union Pacific. November 5, 2011. 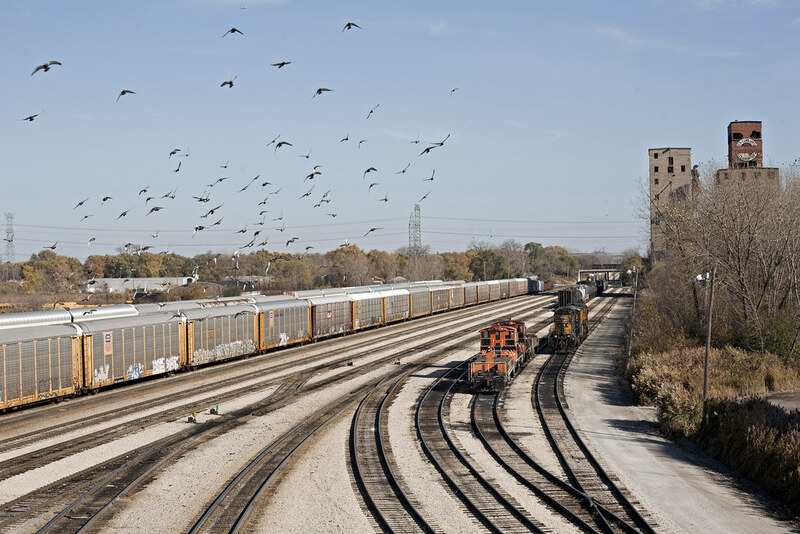 Pigeons resting at CSX's Barr Yard in Riverdale, Illinois, on November 5, 2011. View is looking west from the Halstead Avenue overpass. 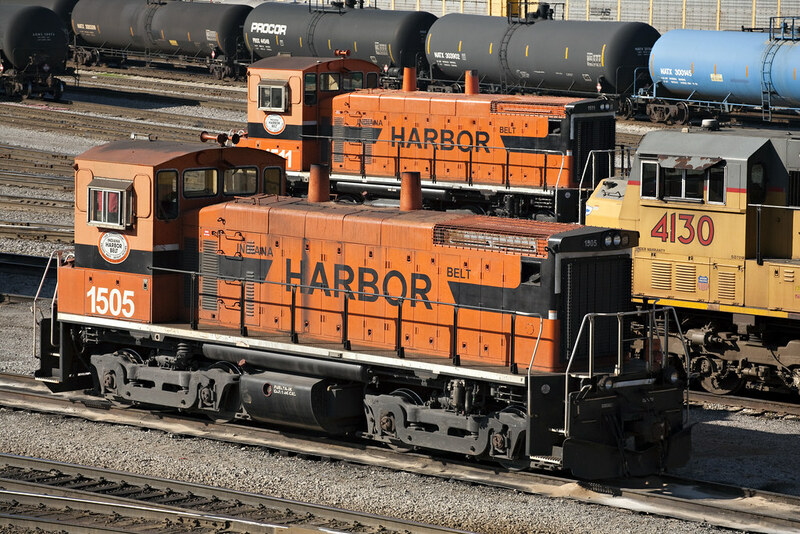 Indiana Harbor Belt SW1500 diesel locomotives in the IHB's Blue Island yard in Riverdale, Illinois, on November 5, 2011. 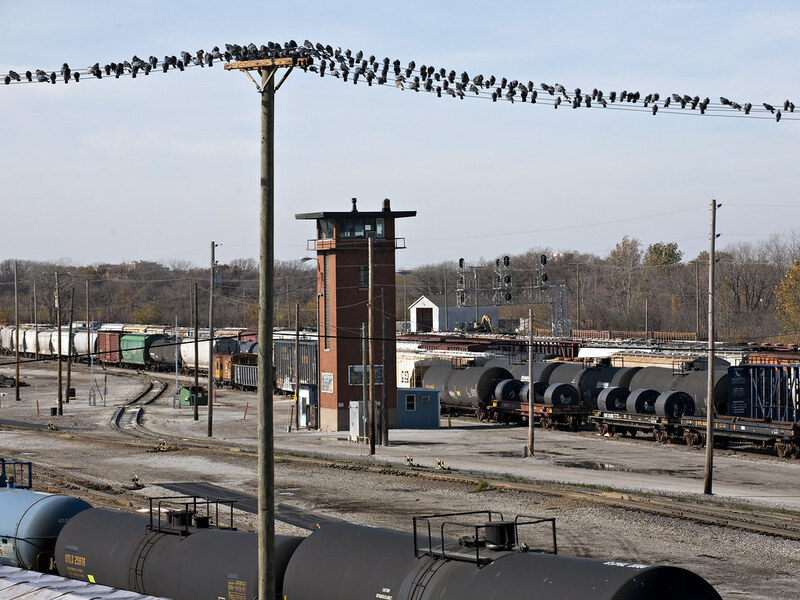 Pigeons circle above the Indiana Harbor Belt's Blue Island Yard in Riverdale, Illinois, on November 5, 2011. The view is looking east off the Halstead Avenue overpass. 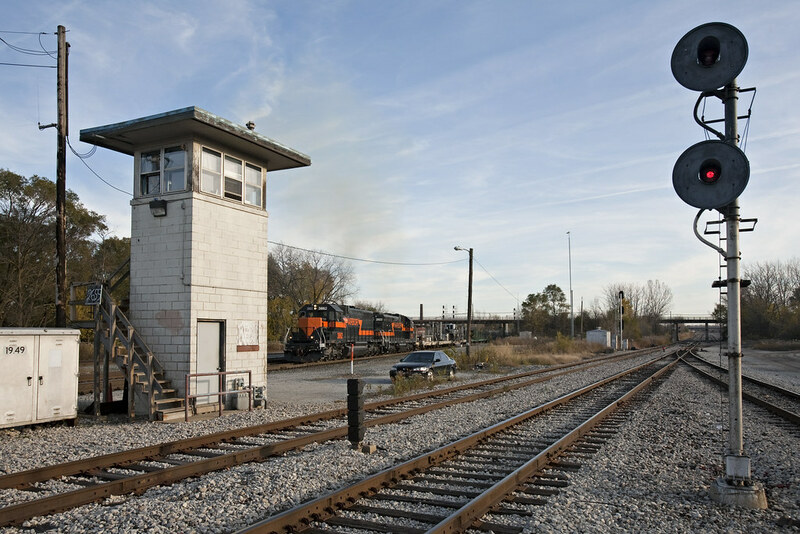 CSX westbound autorack train arriving in the Indiana Harbor Belt's Blue Island Yard in Riverdale, Illinois, on November 5, 2011. The view is looking east off the Halstead Avenue overpass. Iowa Interstate train CBBI--with a single GE wide cab running long-hood forward--on the Metra Rock Island District crossing over the CSX and Indiana Harbor Belt lines at Blue Island, Illinois, on November 5, 2011. Indiana Harbor Belt northbound freight train approaching the crossing in Blue Island, Illinois, on November 5, 2011. 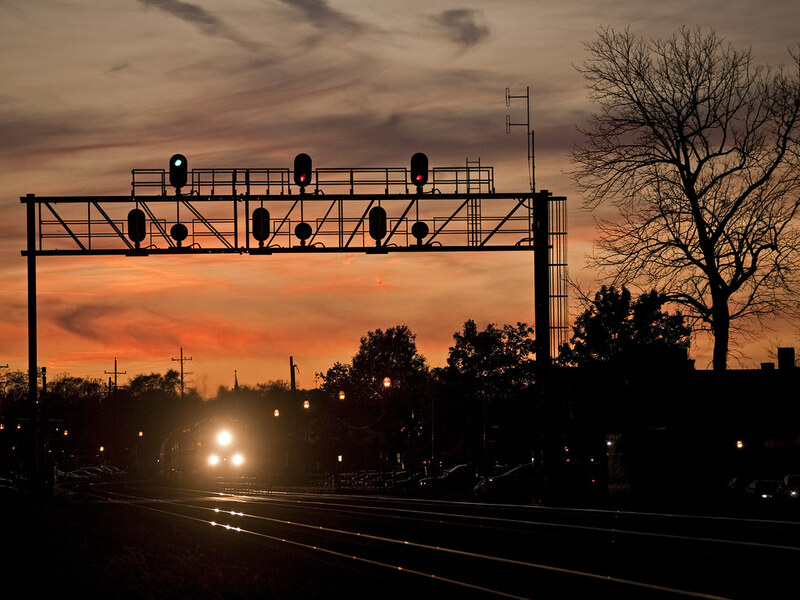 Eastbound Union Pacific grain train approaching Glen Ellyn, Illinois, at twilight on November 5, 2011. 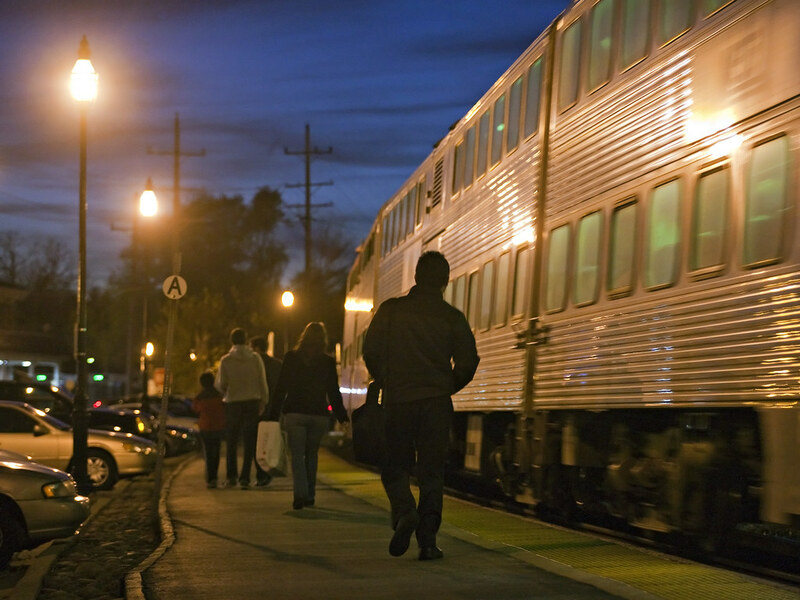 Passengers disembarking from an outbound Metra UP West Line train as it pulls out of Glen Ellyn, Illinois, at dusk on November 5, 2011. 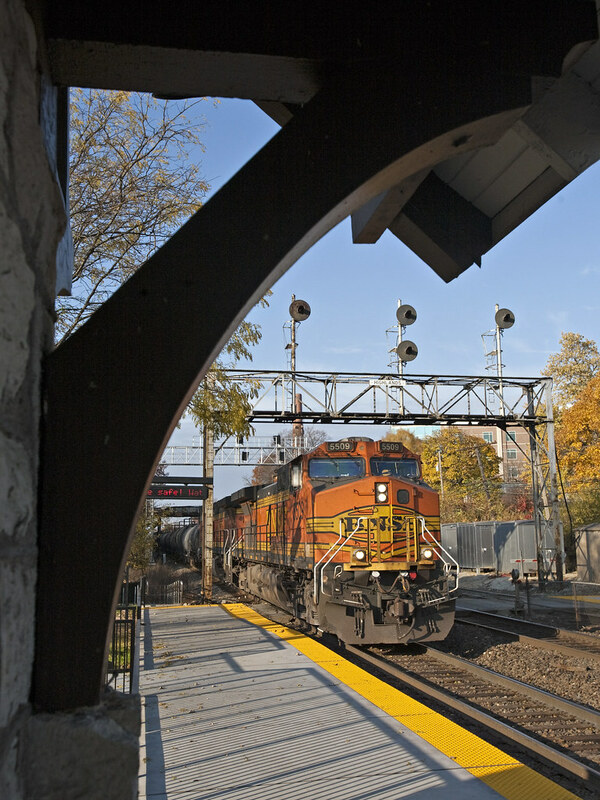 BNSF eastbound freight train passing the Highsland Station in Hinsdale, Illinois, on November 6, 2011. The CB&Q signal bridge is just days from replacement; the new signals are waiting to be cut-in behind it. 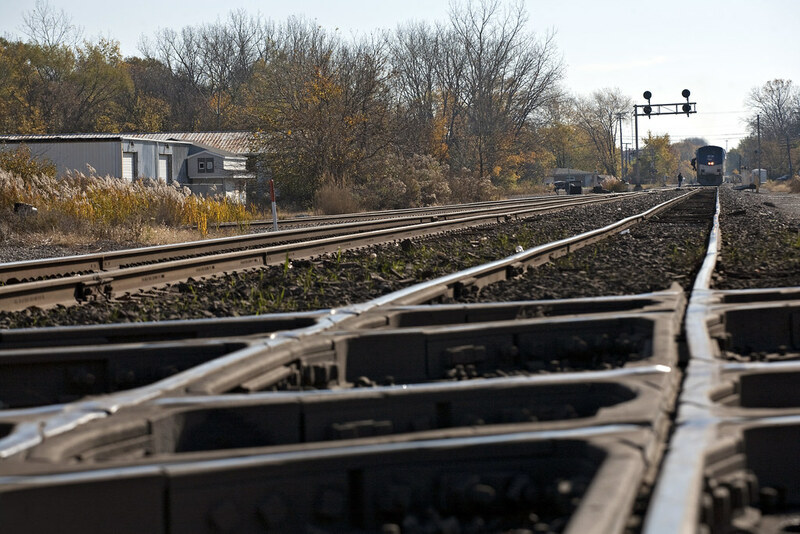 BNSF westbound empty coal train approaching the Highlands Station in Hinsdale, Illinois, on November 6, 2011. Amtrak westbound passenger train no. 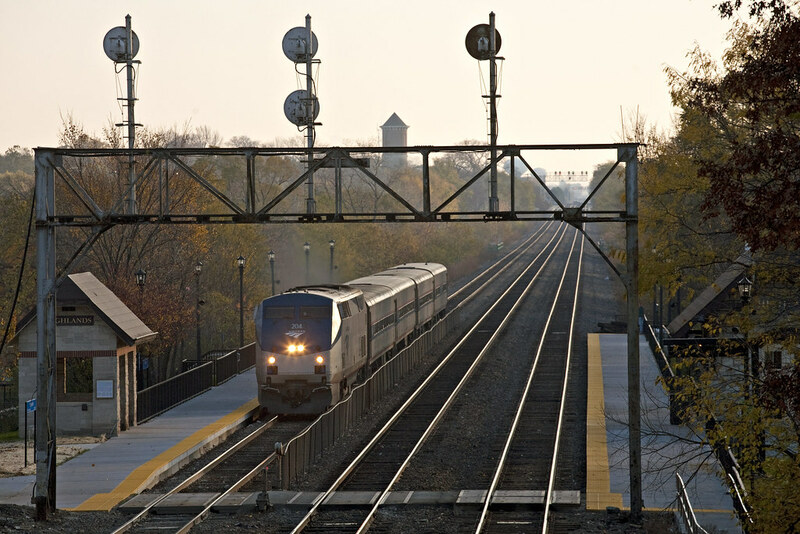 381, "Carl Sandberg," passing the Highlands Station in Hinsdale, Illinois, on November 6, 2011. The CB&Q signal bridge is just days from replacement. Belt Railway of Chicago switcher heading into the bowl at the BRC's Clearing Yard in Bedford Park, Illinois, on November 6, 2011. 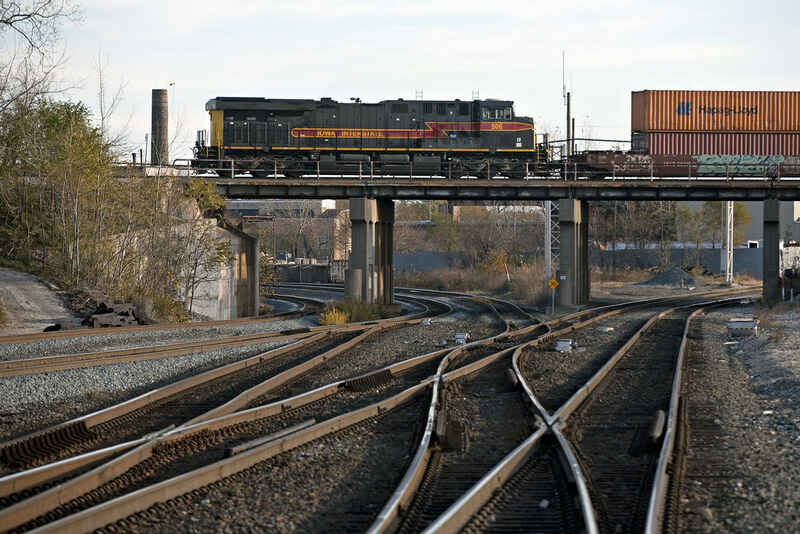 The tower for the yard's double hump is visible in the distance, where two six-axles have about finished shoving a cut of cars over the hump. 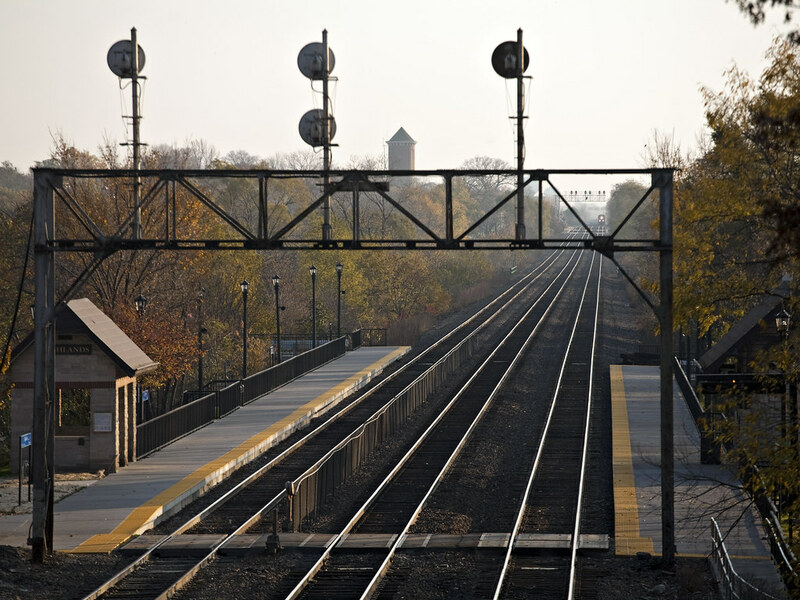 Ash Street crossing in Chicago, Illinois, on November 6, 2011. 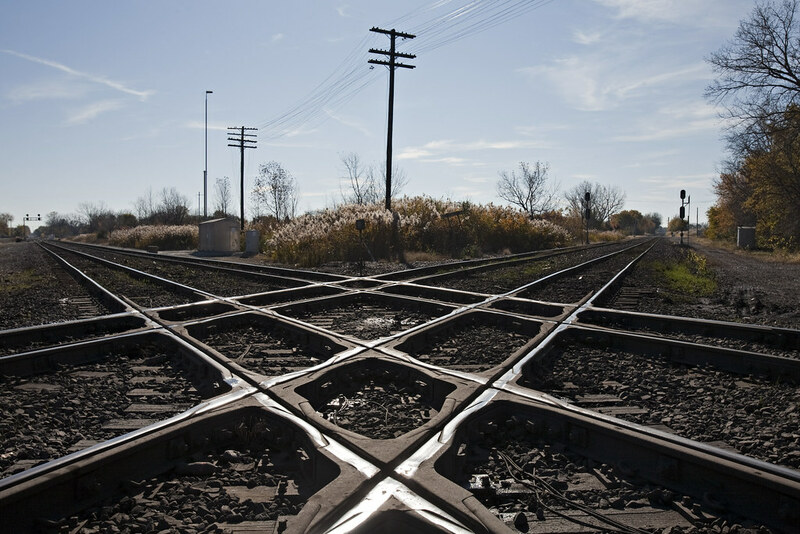 The views are down the Canadian National (ex-IC) to the right and down Norfolk Southern (ex-CJ) and CSX (ex-B&OCT) to the left.